I only just recently learned of Mankind Quarterly and The Pioneer Fund in reference to The Bell Curve. 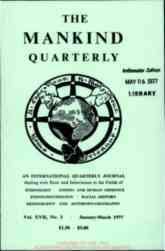 Although the current archives of Mankind Quarterly only go back to 1982 and only provide abstracts, without a login, Unz Review, the former employer of evo-psycho bro Razib Khan and current employer of alt-right Steve Sailer, provides issues of Mankind Quarterly all the way back to the beginning, 1960, and you can download them in PDF format. They don't appear to be full issues, just individual articles. And there are some doozies in there. I found a dire warning against race mixing in an article entitled Ales Hrdlicka on Race Deterioration and Race Destruction by Donald A. Swan from the January 1977 issue of Mankind Quarterly. Here is how it ends. I emphasized the last paragraph. WOW. Nearly half a century has passed since the presentation of Professor Hrdlicka's paper on race deterioration and race destruction. During that time considerably more scientific evidence has been accumulated of the existence of large and significant differences between the primary races of man in cerebral morphology and on a variety of measures of behavior and intelligence. Specialized research designed to investigate the causes of these observed racial differences has demonstrated that genetic factors underlie these behavioral differences to almost the same degree as racial differences in anatomical, physiological, and biochemical traits. On the basis of these studies, it is evident that the white and yellow races are biologically more advanced and have attained a higher level on the evolutionary scale than the more primitive negrid and austrolid races. Consequently, mixture between the more advanced northern races and the more primitive tropical races can only be of disadvantage to the former and result in their racial deterioration. For the United States of America, Hrdlicka's warning of nearly 50 years ago is still valid today—" assimilation of the colored population into the white is the one real cause of anxiety to those who contemplate the future of the American people." In 1966, Swan was arrested on mail-fraud charges. During the raid on Swan's apartment in Queens, New York, the police found Nazi memorabilia, weapons and ammunition. A book by George Lincoln Rockwell of the American Nazi Party was also found, as well as a photograph depicting Swan with American Nazi Party members. Swan died in June 1981. After his death, Swan's papers were purchased and donated to Roger Pearson at the Institute for the Study of Man, under a Pioneer Fund grant of $59,000. I'd love to see the Pioneer Fund's financial statements. I did find an archived copy of the most recent, now defunct Pioneer Fund web site via the Wayback Machine. I also found articles by Richard Lynn in Mankind Quarterly including this one, The Evolution of Racial Differences in Intelligence which provides details on the Northern Superiority hypothesis (I'm not aware of an actual name for it so I came up with one). 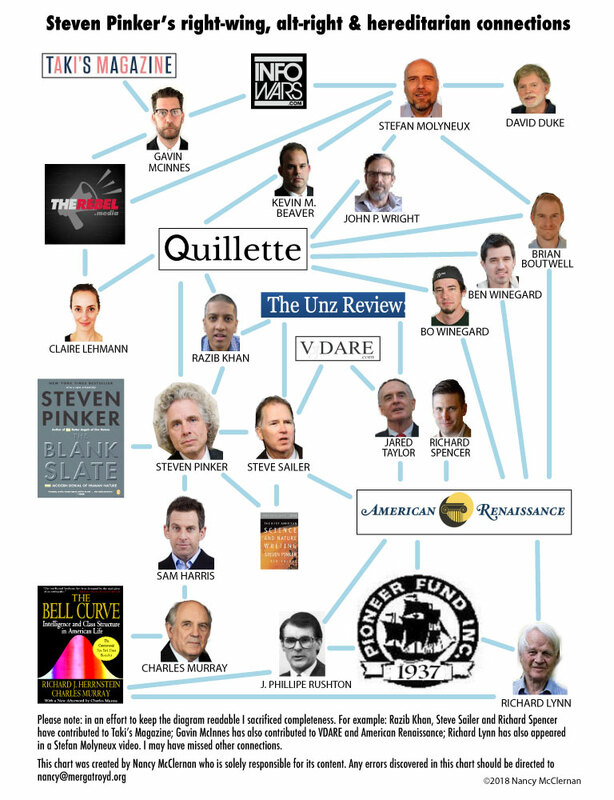 Lynn, like evo-psycho bro Brian Boutwell, is a guest at Stefan Molyneux's media outlets. This is the same Richard Lynn who I discussed here, who claimed that the Irish are less intelligent than the English. Although I haven't found out how that fits in with his Northern Superiority hypothesis yet.